thought they had a few more. Don't seem to be there anymore. If you had an impedance graph this would be easy. Do you know the woofer and any specs? Pretty sure PE's XOs don't claim "Material is very full" (1st thing I look for in ANY XO design), also the "57 lbs of large inductance" is a very nice touch, as is the "instantaneous range of direct access to the target". 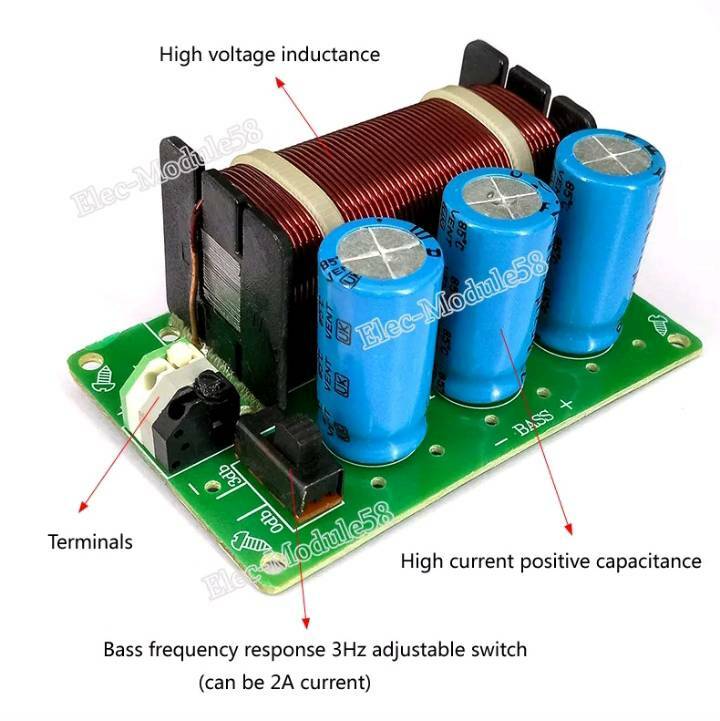 (making some ASSumptions here) IF (big if) that coil is about 3.5mH, and (my take on that "switched" circuit) it's used w/an 8n(ohm) woofer w/the switch in the "0dB" position, the shunt capacitance (to gnd) looks to be about 16uF (2 caps in parallel) which puts a (true) 8n load down -2dB @ 400Hz (-3 near 450Hz). If used w/a 4n woofer (with the sw. in the "3dB" pos. - which means what - who knows?) it ends up being -7dB down @ 400Hz (-6 @ 330). I believe the 3rd cap gets added (in parallel) increasing the shunt capacitance to around 25uF. 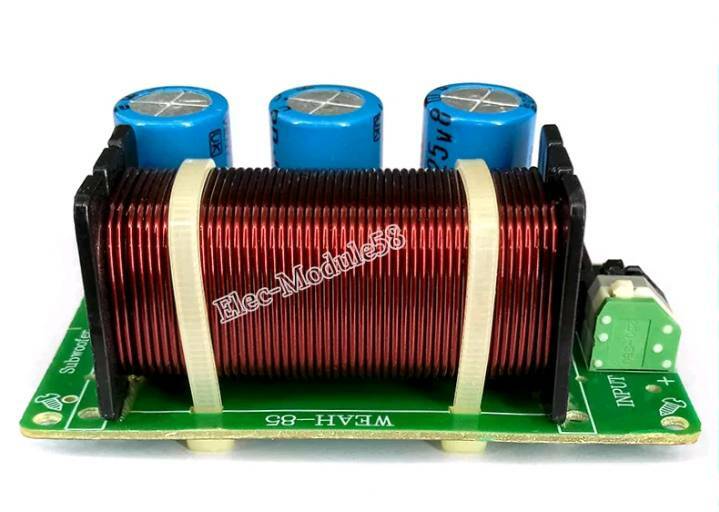 So... the circuit is just the coil in series w/a woofer, w/some cap. (either 16uF or 25uF I think) in parallel w/it (to ground). Nice work Chris, that's what it looks like to me, i.e the last cap switched. 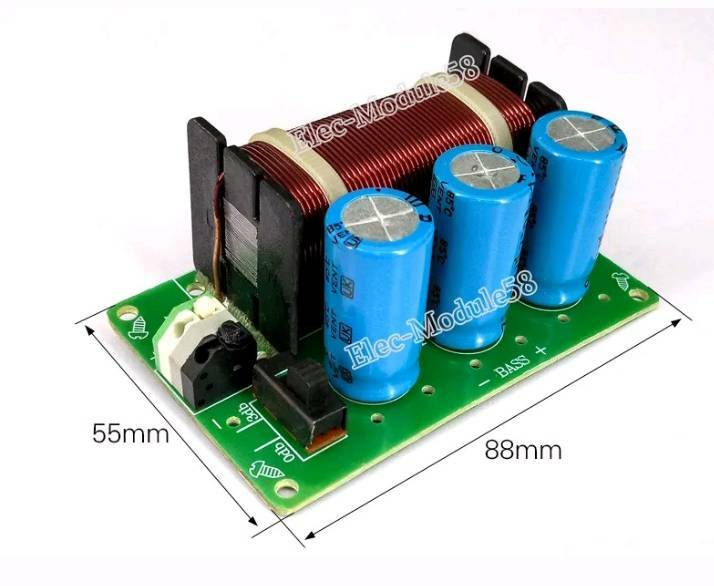 25V caps seems a bit low. 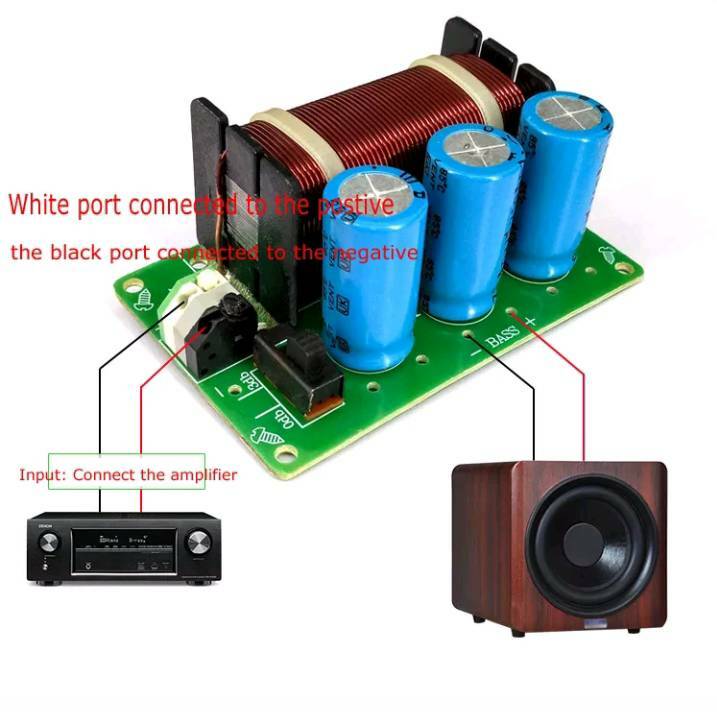 You mentioned the lowpass feeding an amp for a subwoofer (low level signal) but the picture you've shown would be used after an amp, just before the actual driver. Which one are you looking for? From what you've requested, I assume you're looking for a good, fairly sharp, low-pass filter for a sub-woofer. If that is so, I would suggest a 3rd order, series, low-pass Butterworth filter with an F3 of roughly 240 Hertz. That would be a high pass filter. and hats off to Bob in GA for catching my topography error in my last post. It is now corrected. 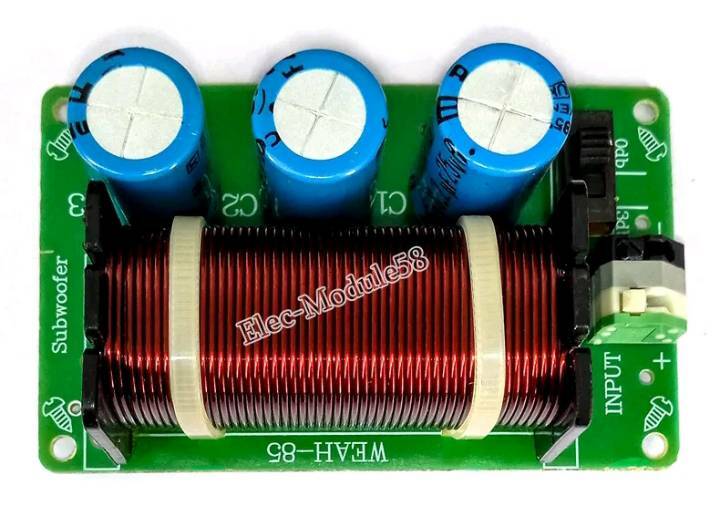 This is a high pass filter.A third order, 240 Hz the filter for a 4 ohm sub would be: Series inductor of 4 mH, a capacitor to ground of 220 uF and a series inductor of 1.33 mH. 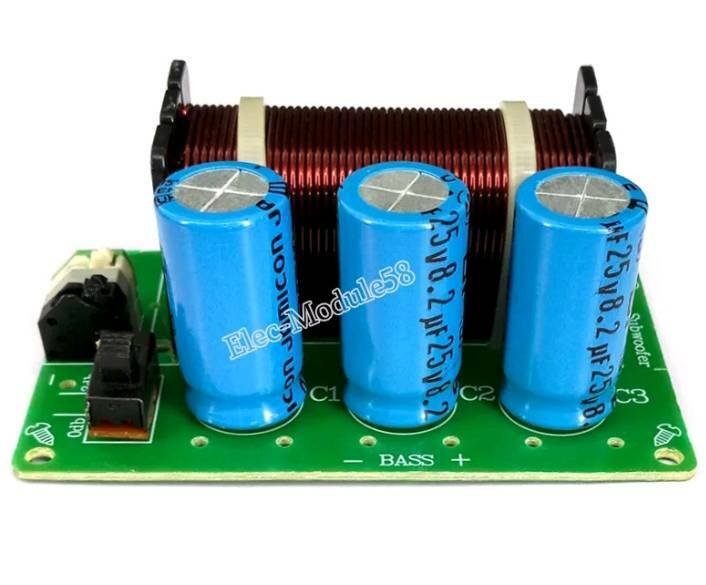 This would be used between a power amp and a passive sub. Per DanP's post, an entirely different set of components would be needed if you're passing a signal to a powered sub (or passing a signal to the amp that is powering the sub). Mike calls it a high pass, but in fact it's a low pass (which IS what you want). Thanks Chris. Bard's first attempt was cap, coil to ground, cap which is of course a high pass filter. 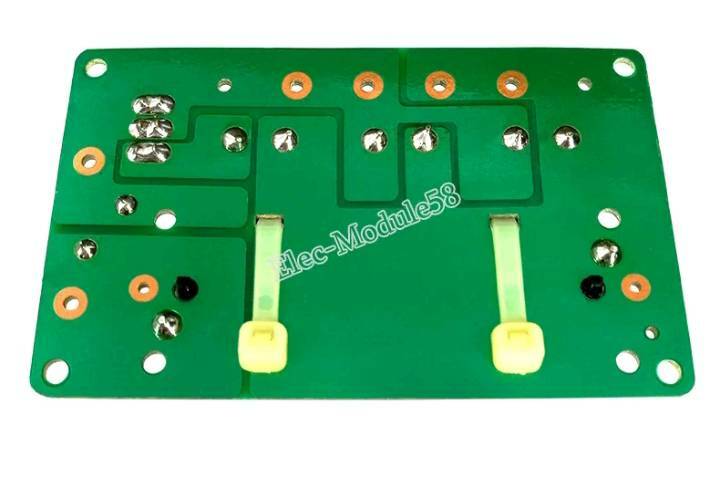 After my post, he changed the circuit to cap to ground, coil, cap to ground which is still not right. I didn't correct his second try but I probably should have. I was trying to not be too hard on a new member. I welcome new members and want to encourage them to keep posting. I was called out for mistakes more than once when I started posting, so, Bard, don't take it personally and keep posting. Mike'circuit is indeed correct for a low pass filter. I assume he knows better and just made a simple mistake. So, let's all be a little more careful before we post. I didn't do a good job structuring my post. The "this is a high pass filter" was referring to the quoted post (actually what I remembered before it was edited). The rest is textbook. Bob, I did edit (correct) my original post, and it now stands correct. It is a 3rd order SERIES filter. Apparently, you didn't see the "SERIES" in the description. This design only takes one inductor, rather than two. Again, the corrected post is a 3rd order, series, low-pass filter with an F3 of 240 Hertz. BTW it is spec'ed for 6.8 ohms Re, which should accommodate an 8 ohm speaker. I see later that the driver in question became a 4 ohm unit. Would have been good to know, up front. Sorry about the confusion.